Dream job vet - we make it possible! topbestappsforkids.com loves our new app! 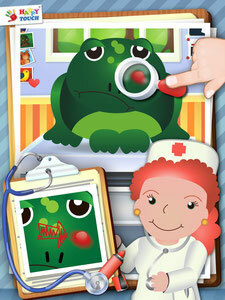 - "We know of no other vet game that even comes close to so many different patients than in this app. Whether dog, cat, mouse or other fancy animals such as warthog, flamingo and a shark - sooner or later, every child will find it's very own favourite animal in the surgery. (...) As different as the animals are, as different are the aches and pains, that the animals are bringing along with them to the kids at the vets. (...)"
Check out the game in action here and read the full review!